Description: Subforum dedicated to SMBX-38A - a fan-made remake of the original SMBX Engine, made by 5438A38A. Forum rules: This is official Europan/American community for the SMBX-38A. Suggested to don't post stuff for this engine outside this subforum. With the SMBX Magic Patcher you create a patch of a SMBX-38A level file which can be apply on a other SMBX-38A files. This is usefull for scirpt submissions e.g. The SMBX Magic Patcher has a userfriedly GUI. It use a own file format: .plx (= SMBX Magic Level Patch). It supports .slp files (= SMBX Level Patcher) too. If you need help then move your mouse cursor over the control and a ToolTip will open and explain it. If you have any suggestions or problems then please tell me. Last edited by Pilzinsel64 on 4 Dec 2018, 12:04, edited 4 times in total. I tested it, this is a nice software. 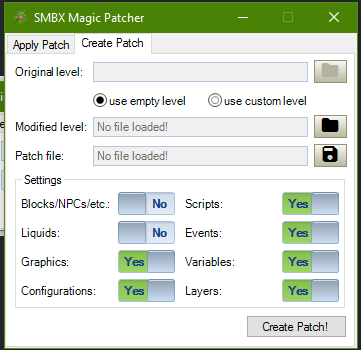 Pilzinsel64 wrote: With the SMBX Magic Patcher you create a patch of a smbx level file which can be apply on a other smbx level files. If you need help then move your mouse pointer over the control and a ToolTip explain it. If you have any suggestions then please tell me. The GUI exactly is 2userfriendly4me. Check out my Artwork Train! Pilzinsel64 wrote: With the SMBX Magic Patcher you create a patch of a SMBX-38A level file which can be apply on a other SMBX-38A files. I just wanted to tell you one thing about this patch of SMBX 38-A ; I'm currently making a SMBX project/episode and I want to make a world in the topic of space by adding gravity that we can do with this patcher but I'm not sure when I will release my project to the community if people who dosen't have this patch, gravity in some levels will works ? Or they must have SMBX 1.4.4 with 38-A and also SMBX Magic Patcher in order to make gravity works ? Whether SMBX Magic Patcher can create a patch for Super Mario 63? Playing game on Freegames66 is not easy al all. How to uninstall a patch from a level?!! how do i uninstall patchs?! Does it fix run time error 9? godisgreatmatt wrote: how do i uninstall patchs?! Just remove the features manually. If the patch countains custom calibration for playables, it'll be harder since you'll need haxagon. Or you can apply an empty patch. Itz_Pet.MaRiO GaMeR wrote: Does it fix run time error 9? That error is something related to your graphic's drivers. This is for applying custom configuration for a level, it's a totally different.